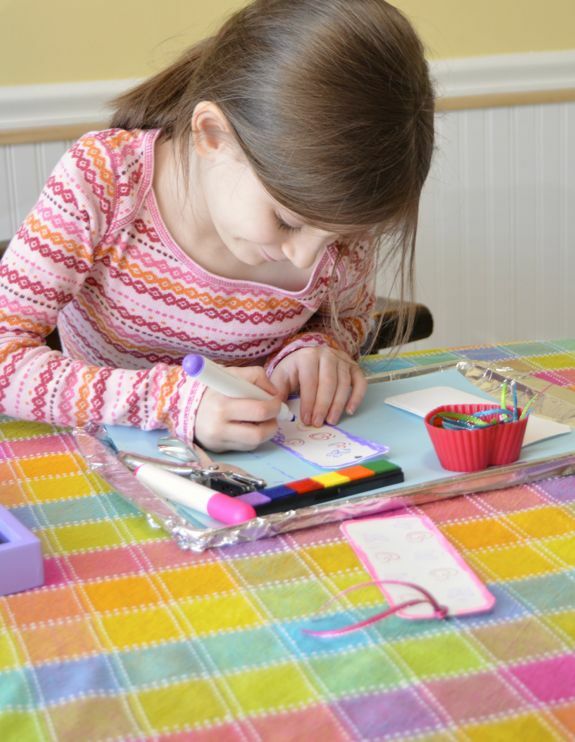 Valentine crafts and activities for kids can be so much fun to do! I’m always up for any excuse to do something crafty, and what better excuse to make handmade gifts and cards than Valentine’s Day? 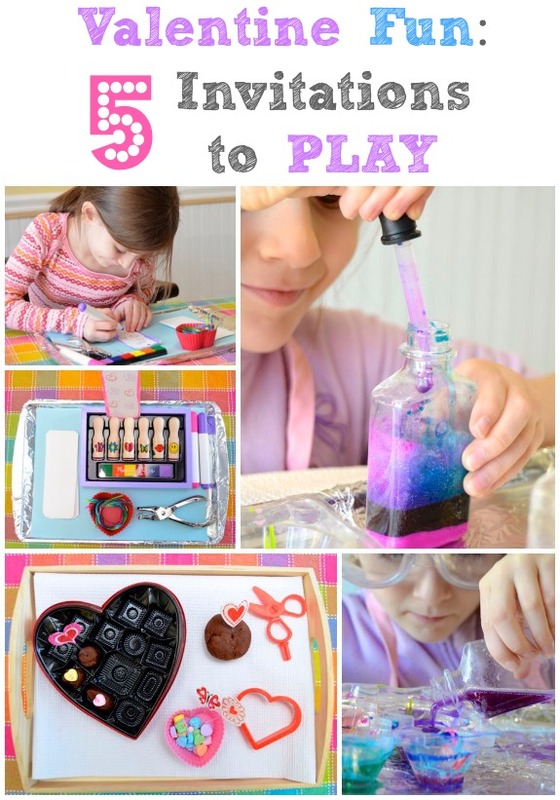 Here are some of our favorite ways to play and create with the kids. A big thank you to Melissa & Doug for sponsoring today’s creative play activities! 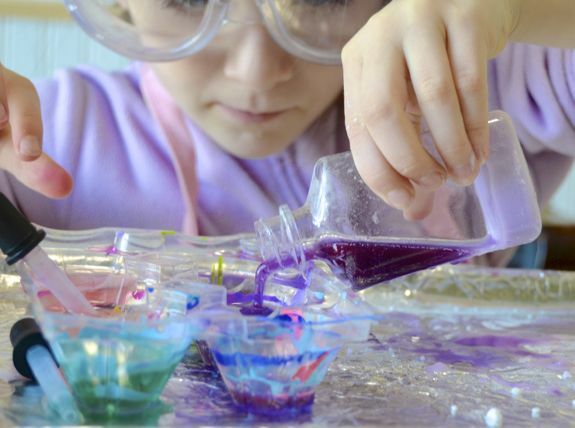 For this activity, you will need: a plastic bottle with a bit of baking soda inside, white vinegar, an eye dropper, an empty plastic egg carton, and liquid watercolors. We had some leftover liquid watercolors from this Magical Masterpieces Melissa & Doug paint set, and they worked beautifully! Place some baking soda into the bottle, then combine white vinegar with a few drops of the liquid watercolor paint in the egg carton. Place the setup onto a cookie sheet to help contain the mess. 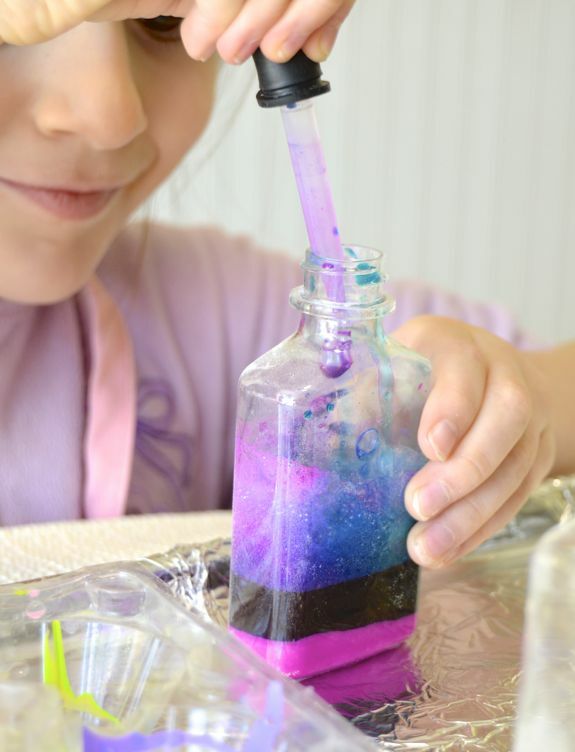 Invite your child over to use the eye dropper to create magical “love potions” that fizz and bubble! Once the bottle gets too full, she may want to practice pouring the potion back into the egg carton to repeat this activity over and over again. This kept my 5 year old happily occupied for a very looooooong period of time! Not only is this a great activity to practice those ever important “pincher” and fine motor skills, but you could also easily sneak in a lesson in color mixing too. Here is a very simple invitation to create handmade Valentine bookmarks for family and friends. You will need some bookmarks cut from heavy cardstock paper, pieces of ribbon, some markers (we used highlighters), a hole punch, stamps and ink pad. 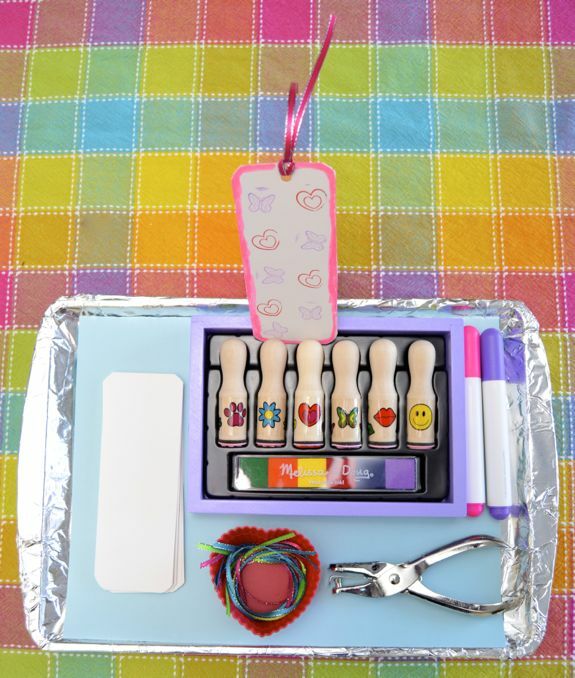 We love this stamp set from Melissa & Doug — perfect handles for little hands, and it comes with a rainbow washable ink pad! My daughter was so proud of the bookmarks she made for her sister and grandmothers! Working on the tray helps to keep the mess to a minimum. Tip — washable ink is removed from little hands easiest with a baby wipe! Another invitation to play that my kids absolutely loved was this pretend Valentine chocolate shop! If the kids are old enough to know not to put play dough into their mouths, you can make your own chocolate-scented play dough with 1/2 cup corn starch 1/8 cup cocoa powder and slowly adding cocoa butter lotion from the dollar store until it forms a dough in the consistency you like. That’s it! 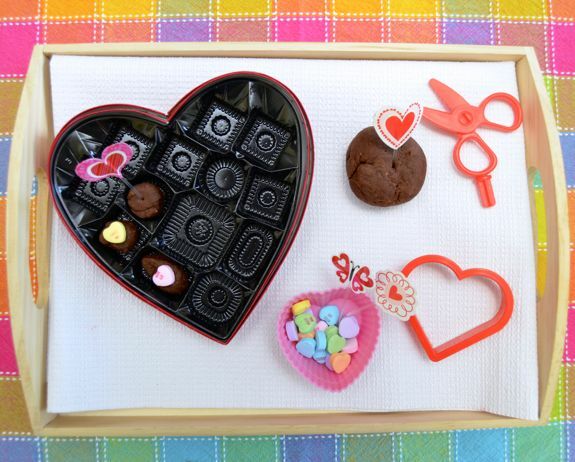 Make into pretend chocolate-scented cupcakes, cookies, or pieces of pretend chocolate for a play Valentine chocolate shop! 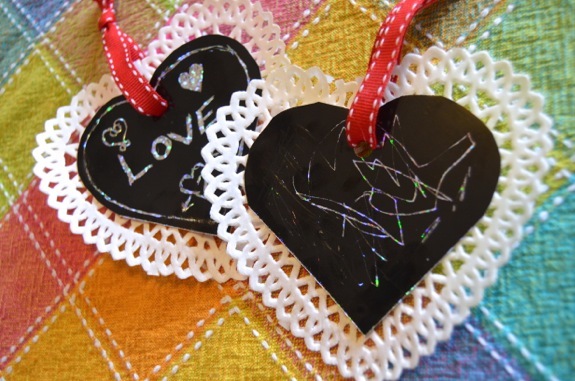 These Scratch Art ornaments were such a great hit last year, and they have the perfect amount of sparkle and lace! You can find how we made them here. 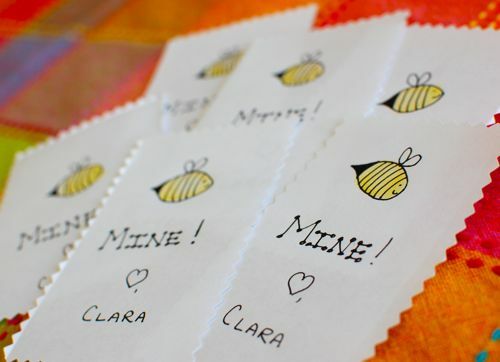 I love that these “Bee” Mine are made from baby thumbprints for a keepsake craft that is sure to be treasured for years to come! Get details on how to make them here. Build a “Love Nest” pillow fort! Craft colorful heart wrapping paper.